“Framing a statue of the Virgin Mary, two choir boys stare at us then pull on masks of the sun and moon. The camera turns and we discover, little by little, a small assembly gathered in an Andean church. To the notes of a sextet of folklore musicians, the procession begins to move. In showing a ceremony celebrating jointly the astral divinities and the mother of Jesus, the prologue places Altiplano impreceptibly under the sign of syncretism. Summoning multiple references, marked by a sturdy belief in the power of cinema to suggest the complexity of things, Peter Brosens and Jessica Woodworth invent their own cultural mix. Defined by what is currently at stake in contemporary society, the film is simultaneously fragmented and eminently coherent, mystical and global. Marked by a certain rejection of materialism and individualism, their vision is accompanied by an underlying unrestrained ambition as they seek the means for a re-enchantment of the world. 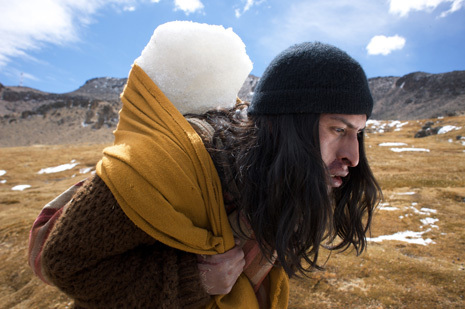 Carried by excellent actors, an incredible intensity of emotion, exuberant and elegiac, tragic and lyrical, Altiplano answers to no canon in force today. Its disconcerting dramatic structure is even punctuated by a rift right in the middle. Cinematographically speaking it is not difficult to trace filiations with, notably, Tarkovsky. The fluid direction and minimal editing result in tableaux of breathtaking beauty, establishing a rhythm, recalling the Russian master, that is conducive to an exploration of the soul. Above all, Brosens and Woodworth share the idea that the misfortunes of humanity stem from a decay of the spiritual and that redemption comes from self-sacrifice and the fulfillment of irrational acts. She could have been just another Peruvian girl, living in the Andes, taking care of her crops and singing in local contests. But someone saw something in her. This someone was Claudia Llosa, the filmmaker who found Magaly Solier in one of the poorest areas of Peru and asked her to attend a casting for a movie. That was the beginning of a unique career, peculiar because nowadays Solier is one of the best actresses in Peru, even though she never took acting lessons before her first leading role in Llosa’s Madeinusa. Now, with four movies and an album, she is not only a celebrity in her country but also a muse for foreign directors. Audiences around the world admire her authenticity; not only in front of the camera but also in every interview she gives. Nisimazine was no exception. In a warm and friendly talk, Magaly told us what has changed in her life in these last years. “Now I am more confident, I talk more. Before I was not able to talk like this with the journalists, now I can’t stop!”, she says, laughing. “I haven’t changed much, but my lifestyle has. I miss the home food, I miss everything I had in my garden back home”, she says, but also adds that now she enjoys new things that she did not have in her life in the Andes. “I have bought a computer; I created my songs with it. I’m updating with the technology and thanks to it I have accomplished my dream of releasing an album. I wanted to do it since I was eight years old”. Actually, Warmi, her first musical work, has kept her focused on recording and concerts for the last few months, and that’s why she hasn’t been in another film since Altiplano (selected for this year’s Semaine de la Critique), directed by Peter Brosens and Jessica Woodworth. Her previous work includes Claudia Llosa’s Madeinusa and The Milk of Sorrow, as well as Dioses by Josué Méndez. The roles Magaly has accepted have been closely related to her life experiences: she has seen cases of child abuse (as portrayed in Madeinusa) and post-traumatic distress in victims of terrorism (as in The Milk of Sorrow), and feels compelled to denounce these dramatic realities. In fact, the environment she comes from (the southern Andes of Peru) has suffered over past years with problems of violence and extreme poverty, and she has gone through these situations without losing her faith in the possibility of change. Now, in Altiplano, she is Saturnina, a young Peruvian woman who confronts multiple tragedies in a town suffering the consequences of irresponsible mining. “She is a very different character; she is not like Fausta, from La teta asustada. Saturnina is very active, she protests, she stands up against the injustice and defends what she loves”, she points out. About working with Brosens and Woodworth, she says that “they were very different to the style of direction I was used to. They gave me a lot of freedom to perform”. Magaly accepted to work in Altiplano because of the denunciatory content of the script. “The vision of these directors is really interesting, I’m glad that they are interested in the topic of mining. They dared to denounce, they were not afraid of saying what really happens in my country”. Altiplano has the potential to be controversial in Peru, but Magaly is not worried about it. “Some Peruvian people have a complex, they don’t want to talk about their bad issues, and they criticize these kinds of movies without having seen them. That happened when The Milk of Sorrow won the Golden Bear at the Berlinale, but it makes me laugh”. In fact, Magaly cares more about the importance of calling attention to the problems of Andean people than about the critical reception. “I would like to keep working in movies with this kind of message, which denounces things nobody talks about”, she states, confirming that this actress is not just a powerful presence onscreen but also a conscious and committed young woman who is only just starting to show her inner magic to the world.